McAfee Internet Security 2014 ($56 for one year of protection on up to three PCs) offers adequate protection and an intuitive interface. The installation process can be a chore, and finding specific settings can be difficult, but its main shortcoming is that it offers fewer features than some of McAfee’s other products, despite its higher price. In AV-Test’s real-world protection tests, McAfee successfully blocked 98 percent of all zero-day malware attacks (including Web and email threats). Though quite good in comparison to Microsoft Security Essentials’ performance (71 percent of samples blocked in the same tests), that mark lags behind the perfect scores posted by Eset Smart Security 7, F-Secure Internet Security 2014, Kaspersky Internet Security 2014, Norton Internet Security 2014, and Trend Micro Titanium Maximum Security 2014. Like most of the other suites, however, McAfee detected 100 percent of widespread malware that had been discovered in the month prior to the test. In AV-Test’s performance assessment, McAfee received a score of 5. This translates into slightly slower startup and shutdown times and some lag in opening programs. 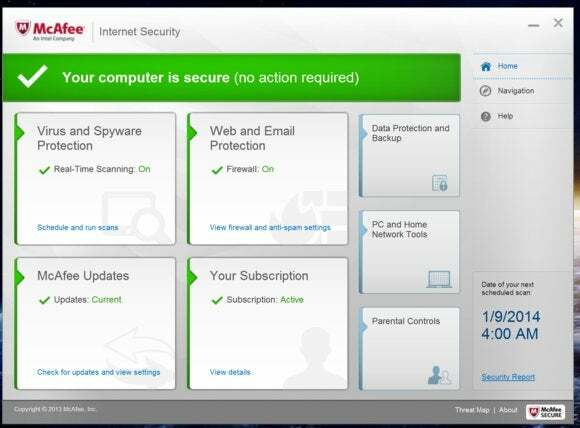 McAfee Internet Security 2014's interface makes it easy to find your way around. Installing McAfee Internet Security 2014 is somewhat arduous. First, the program scans for threats to ensure a smooth installation. Next, it asks you to log in to your McAfee account, using the email address and password that you used when you downloaded the program. Then it downloads the rest of the installer—which can take some time if you’re on a slow connection—installs the program, and requires a system reboot. To its credit, McAfee Internet Security 2014 has among the best interfaces for Windows 8 touchscreens, with large buttons and banners that even clumsy fingers can easily tap. The main window has a large banner across the top that appears green if you’re protected, and red if you’re not. Below the banner are four large buttons for virus and spyware protection, Web and email protection, updates, and your subscription status. To the right of these buttons are three smaller buttons for data protection and backup, PC and home network tools, and parental controls. Each section has its own settings menu—an arrangement that can be a bit confusing. Settings menus have clickable banners that you tap to open. Inside, they look like typical checkbox-and-radio-button menus. McAfee explains most of the advanced settings in simple language, and each menu features a ‘Learn more’ link that leads directly to the appropriate help section. 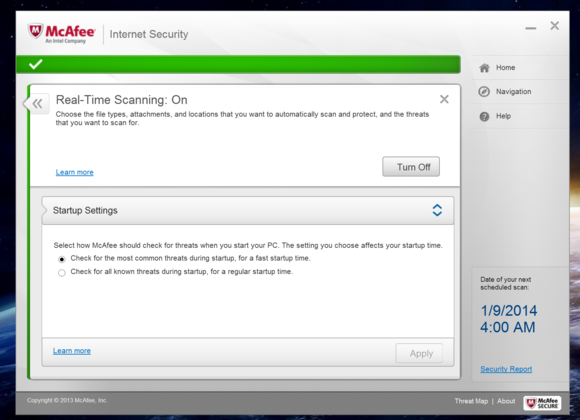 McAfee Internet Security 2014 offers reasonable protection and an intuitive interface, especially for Windows 8 users. But the company sells other products that offer greater functionality at a lower price. For example, McAfee All Access costs just $50 (for a limited time) and provides unlimited protection for all of your devices (including mobile), as well as online and social network protection. McAfee says that it continues to carry the Internet Security line for people who aren’t ready to switch to its all-inclusive products, which are equally effective against malware. McAfee's touch-optimized interface is ideal for Windows 8 users, but the suite is a bit weak on zero-day defense.